Body Snatchers Needed, Because This One is a Little Ripe! Below is a photograph of my great grandfather at George Washington University. He not the corpse (yet) but he’s number 4 in the photograph. 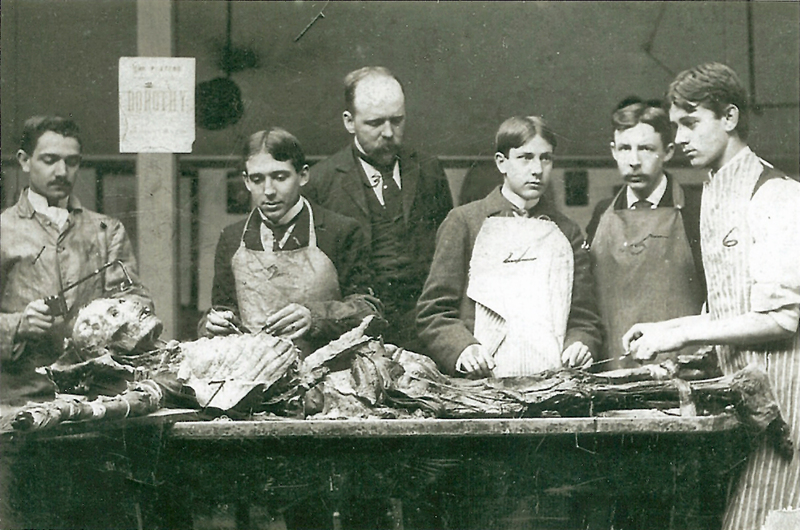 Sadly medical school was very dangerous at the time, and one of out five medical students caught tuberculosis. My great grandfather Paul Fearson Graham was one of them. He died a few years after this photograph was taken. He didn’t donate his body to science! Still, I admire him for wanting to be a physician at a time when it was an incredibly dangerous profession. Also note the position of the feet, this poor corpse I hope didn’t DIE by being twisted! Number 4, he doesn’t look like this cadaver smells pleasant. My grandfather was a very young boy at the time his father died. He was found a job at the Capitol as a page. He appears in a well known painting of Congress voting to go to war. (World War I). Later he moved to the Eastern Shore and met my grandmother, a young nurse and actress. They were happily married and he went on to be a good father to his two children. I remember him as exceptionally smart, always reading and interested in world events. We keep this photographs framed on our fireplace mantle. It’s a good way to judge people that come into our home. If they like it, we’ll probably be friends! Wow. And I thought my med school cadaveric dissection course was killer. What a terrible thing! Poor, brave man!